Translate UI texts and get suggestions for UI texts during development. Use a dedicated API to get good quality suggestions for English texts when you develop applications. Translate texts for applications that you manage in on-premise Git repositories, Web-based Git repositories, and the Git repository on SAP Cloud Platform. Use the integration with SAP Cloud Platform SDK for iOS Assistant to translate app texts. Get suggestions for UI texts and translate .properties files directly from your projects in SAP Web IDE. 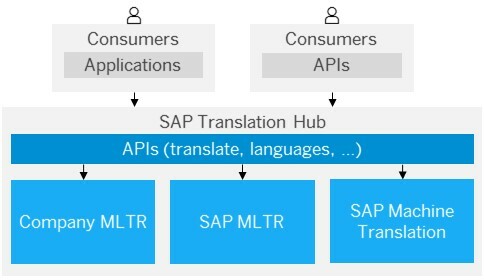 SAP Translation Hub lets you translate your UI texts by using a repository of SAP-approved translations and terminology as well as machine translation. You can access the translation resources of SAP Translation Hub by consuming a range of APIs or by using integrated workflow scenarios on a UI. Furthermore, developers can get suggestions for their source texts during the development phase, which improves the accuracy of source texts and saves time. The integrated workflow scenarios let you manage the translation of texts from various development environments on a single UI. You can also use the UI to carry out post-editing and review steps, and to transfer the translations to the source development environment. Translate UIs into more than 40 languages using SAP's translation experience.